Could it be true, as people are suggesting, that on top of their own £1m legal costs NE picked up the tab for Walshaw Moor Estates’ legal costs? And could those legal costs have amounted to £3m of taxpayers’ money? I’ll ask NE and Defra – I’m sure they will want to tell us. All birds are brilliant! It goes without saying, but I’ve said it. But it could just be that some birds are more brilliant than others. A while back, in a blog about cormorants, I said that cormorants were quite pretty really, which might be stretching things a bit, but they wouldn’t come bottom of my list of favourite birds (even though, all birds are brilliant, I say again). Since then I have been wondering which species would be bottom of my list, and I’ve only considered UK species in my musings. It’s been a really difficult choice, much more so than choosing one’s favourite species. I’d have a shortlist of 4-5 favourite birds and I wouldn’t get into trouble at all whichever I chose (would it be hen harrier, roseate tern or what?). But one’s least favourite? That’s a different matter – for all birds are brilliant. Do you remember, not many of you will be old enough even to have a chance, a Marty Feldman sketch where he goes to buy Olsen’s Standard Book of British Birds, from John Cleese, in a bookshop (do you remember them?). Have a look at the link here – the bird book is a few lines down. Anyway, it shows that Marty Feldman didn’t like all birds. You might have noticed that I am spinning this out a bit – I’m still not sure that I should tell you. Yes, I should – it’s……. 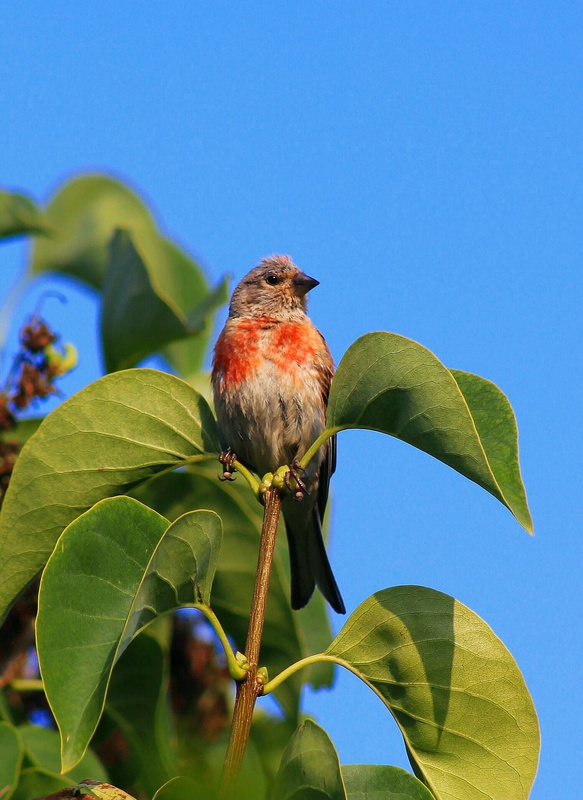 the linnet! There, I’ve said it. Now, of course I like linnets, but they are bottom of my list under some circumstances. I like lots of linnets. Flocks of linnets are fine. But a single, well-seen, male linnet is a poor bird (although I still like them, of course). There is something rather pathetic about a male linnet. Weak song and droopy plumage. It is the chinless wonder of the UK bird world. That red breast which has nothing like the depth of colour of a robin or the decisiveness of delineation of a redstart. It’s a weak breast for a weak bird. And it has a slightly irritating wing patch and that terribly dull grey head. And a bit of drab brown thrown in. Well, that’s my choice and I’m sure you will take me to task over it. But what is your choice of least favourite UK bird? I’ve been paying more attention to the road verges since Sarah Pettegree wrote her excellent Guest Blog here and since Plantlife launched its verges campaign. And so I was more susceptible to making the link between this press release from CPRE about lowering the speed limit in rural areas and the state of our verges. The main justification for over-enthusiastic verge cutting is road safety. We are all in favour of road safety. If rural speed limits were reduced then the need for verge trimming for visibility at high speeds would also be reduced. And therefore, if you like pretty plants you might want to support a move towards slower cars. Isn’t it interesting how things join together? After a twitter chat about damaged verges, Norfolk County Council provided some useful information. One useful source of information for local authorities and others is the document: Well Maintained Highways: code of practice for highway maintenance management which is produced by the UK Roads Liaison Group. Now, clearly, the ins and outs, ups and downs, of highway maintenance management are far wider and deeper than just how and how often verges in rural areas should be cut – almost all human life is here, and many of the words in this document are there to prevent human death so it is, indeed, serious stuff. Nature conservation and biodiversity do get a look-in in this document – on pages 231 and 232. There, it is said ‘Highway verges and the wider ‘soft estate’ both have implications for conservation and biodiversity. Specialist advice should be sought on the management of these areas, in order to achieve the correct balance between safety, amenity, nature conservation and value for money.‘. That sounds good – I wonder how often and how widely local authorities seek specialist advice on frequency and timing of cutting? Later in this short section the document quotes Staffordshire County Council as advising that : ‘where fine stands of wild flowers are present in the verge, the timing of cutting operations should be varied to allow the flowers to set seed. Varying the times of cutting from year to year will help nature conservation/biodiversity, since a greater number of plant species will then be given a chance to flower and seed in at least some years. Such variations in the cutting regime should not take place, where it would be detrimental to safety due to obstruction of visibility.’. So, although the road safety aspect is mentioned there is clear guidance that unless road safety is of overriding importance (and how should that be judged I wonder?) then varying the timing of cutting from year to year is an important and best-practice aspect of roadside maintenance. this is because different plants seed at different times, but seeds live a long time in the soil, and so by varying timing each year should allow a proportion of plants to set seed and for those seeds to be added to the seed bank. It might be worth asking your local authority whether they follow this practice and how often they override in on safety grounds and how those safety grounds are quantified. I’m just guessing here really, but I suspect that this code of practice (which doesn’t look bad on the face of it and should be promoted to local authorities) has not been reviewed by Natural England or any other conservation experts – it’s just a guess because if it had been then perhaps the reference to English Nature (which ceased to exist in October 2006) would have been removed from this document which was updated in January 2012 (and many times since 2006); although how long its successor body, Natural England, will be with us is a matter of conjecture. The rather diminished Big Butterfly Count? It’s time for the Big Butterfly Count– good luck! Have you ever thought how beautiful are butterflies? Me too! 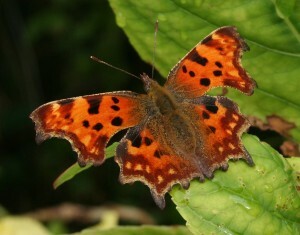 Then imagine this butterfly without its wings – not so pretty then is it? And I just wonder – will the Bird Fair survive the weather given that the Game Fair has not? And what would that tell us about the view of the gods? Natural England spent over £1m of your money pursuing legal action against the Walshaw Moor Estate for alleged breaches (but a mere 43 of them) of the Wildlife and Countryside Act and the Habitats Directive. The alleged offences related to the building of tracks, paths, car parks, grips, ponds, butts and other associated infrastructure for which the Walshaw Moor Estate did not obtain Natural England’s consent. Natural England refused to disclose the witness statement given by their director, Andrew Wood, in these legal proceedings even though, as I understand it (and NE has not at any stage denied this) that witness statement was made in open court and as part of Mr Wood’s job (for which you and I as taxpayers, pay him). It is my belief that that witness statement would spell out in some detail the gravity of the alleged offences and their environmental importance. I repeated my request to NE to reveal that document as, as I understand it, if I, or you, had wandered into the court room at the time that Mr Wood was making his statement then I, or you, could have told anyone we liked about it. This was a public statement, from a public servant about a matter of public interest. And yet NE will not disclose this document to me or to the couple of dozen or so of you who have also requested to see it under the Freedom of Information Act and/or Environmental Information Regulations. This is a shocking, truly shocking, state of affairs. It reflects very badly on the transparency of Defra and its agencies that this information has not been forthcoming. It can only raise alarm bells and suspicions that there must be some very embarrassing information in Mr Wood’s witness statement. This might be true as people who might know what they are talking about have described this statement as ‘dynamite’ – but I’d much rather see it whether it is dynamite or not. Is this just stubbornness? Well, yes, I am occasionally stubborn, but stubbornness in a good cause is determination by any other name. Is this a good cause? I think so, because the management of the English uplands is a matter of concern to me and to many others. Much public money goes into the uplands, and goes to estates such as the Walshaw Moor Estate, and that public money is spent to protect and enhance public goods such as landscape, clean water and wildlife so there is a real public interest in this type of event where an estate is at one moment held to have perhaps committed 43 offences and another moment all that is put behind us and legal proceedings stopped. We know that as part of the settlement the Estate has not been required to remove any of the existing structures. Whatever the thinking behind NE’s volte face it may well have wide-ranging implications for the management of other similar designated sites. Also, the handling of this affair by NE and by Defra does not meet the standards of openness that we should expect from public bodies. The long delays and scant disclosures are not what we should expect of public bodies. They can also be seen as being obstructive and seeking to make it difficult for further legal action to be pursued by interested parties. Therefore, I have written to my MP, Louise Mensch, asking her to ask Defra to instruct Natural England to make Andrew Wood’s witness statement available, and to make a full statement about the Walshaw Moor affair. The text of my email to Ms Mensch is attached below and I would suggest that if you feel that the future management of the English uplands and/or transparency of public policy and decision-making are important matters then you write in similar ways to your MP. Thank you. You and I are unlikely to agree about much politically but [passage omitted]. I am writing to ask you to write to Richard Benyon at Defra and ask him to instruct Natural England to make publicly available the witness statement that NE director, Andrew Wood, made at a legal case earlier this year concerning 43 alleged breaches of the Wildlife and Countryside Act and EU Habitats Directive. I have asked to see this witness statement under the Freedom of Information Act and the Environmental Information Regulations and been refused twice by NE. Many others have also asked to see this document and also been refused. The witness statement was made by Mr Wood as part of his work for Natural England (a public body) and given (as I understand it) in open court. If I had wandered in off the streets that day I would know what he said and would be able to talk openly about it. Not to disclose this information is, in my opinion, shockingly obstructive behaviour by a public body. I hope you agree, and I hope that your influence to ask for disclosure as an MP will be greater than mine as a taxpayer. The importance of the witness statement is that it set out (I believe) the reasons why NE were taking legal action against the Walshaw Moor Estate and the seriousness of the alleged environmental damage caused by the estate to the moorland which is designated for its wildlife interest. The case presumably has importance for NE’s treatment of other upland areas designated under environmental legislation. NE dropped the legal case against the Walshaw Moor Estate and have not offered a full explanation of why they dropped it. The legal case cost the taxpayers of Corby and elsewhere over £1m. I am trying to get to the bottom of why the case was dropped after so much of my money went into preparing it and fighting it to a certain extent. Mr Wood’s witness statement is a key part of the explanation. I am also concerned that Defra and NE have not responded properly to my FoI and EIR requests. In particular, Defra’s responses have been slow, uninformative and drafted by one of the staff closely involved in this case (which seems poor practice to me). Natural England have hidden behind Regulation 12(5)(b) of the Environmental Information Regulations as their reason for non-disclosure. They say that as the legal proceedings were not pursued then the witness statement remains an internal document. I believe, that the witness statement was made in open court and therefore that explanation is a weak justification for being obstructive. In any case, the dropping of the legal case was very strange in itself and a public body should not use its strange behaviour in one area to justify its strange behaviour elsewhere. If the case had not been strangely dropped then the witness statement would be publicly available right now, I assume. By taking undue time to respond to these requests and failing to be open in their responses Defra and NE are making more difficult the task of others who may wish to pursue these legal matters independently. For example, the time period for judicial review has now passed but other legal options remain. It looks as though Defra and NE are trying to cover their tracks and make legal action, which might embarrass them, more difficult. If you wish to know more about this matter then go to my blog www.markavery.info/blog/ and type ‘wuthering’ into the search engine and you will find 23 blogs about this matter including my FoI/EIR requests and Defra’s and NE’s inadequate responses to them. Or i am happy to brief you further on this matter but i would ask you please not to delay writing to Defra. In conclusion, please write, on my behalf, to Richard Benyon at Defra and ask him to instruct NE to make Andrew Wood’s witness statement available publicly as a matter of urgency. There is no reason why this should take Defra and NE any more than a week after receipt of your letter and please ask them to comply quickly. Please also ask him to put on the Defra website a full explanation for the mysterious and suspicious behaviour of Natural England in dropping their legal case.